Simple automobiles are a thing of the past ….. as automobile technology progresses and vehicle manufacturers strive to design and produce “the next big thing,” many are quickly overwhelmed with the number of decisions to make when purchasing a new or even used vehicle. However, there are many things that remain constant in this ever-changing world and one such thing is car maintenance. If you ask 10 people how often they do something “maintenance wise” to their car, you will get 10 different answers. Some think that an oil change every 3,000-5,000 miles is all the maintenance that they need to keep their car on the road. Yes, it is extremely important but there are so many other components to your vehicle. Take the cooling system for instance. Have you ever changed the antifreeze in your vehicle or did you even know that it is a maintenance item? By Wikipedia definition, “coolant is a fluid which flows through or around a device to prevent its overheating, transferring the heat produced by the device to other devices that use or dissipate it.” Our opinion is that in order for a fluid to do its job properly, it needs to be replaced within a reasonable timeframe. Volkswagen and Audi consider their antifreeze as a “lifetime” fluid so your owner’s manual will not specify an interval. We recommend a cooling system service/flush when having your timing belt and water pump replaced. Proper periodic inspection of the cooling system can detect leaks before they cause damage. Leak prone areas include the radiator, water pump, cooling hoses and seals, thermostat, heater core, etc. 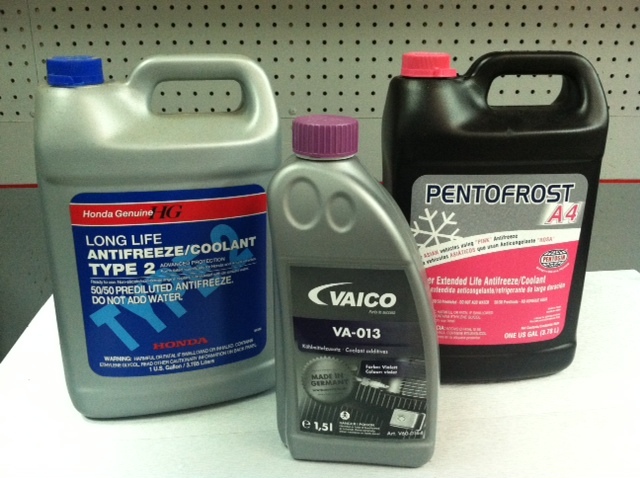 ** Remember that VW and Audi coolant is Pink (G12 and G12+) or Lilac (G13). If your Volkswagen or Audi has green “universal” coolant, it is time to get it flushed now. Mixing G12 or G13 with green coolant = gel. Do not take your vehicle for granted. Just because you do not have a Check Engine Light (MIL) on does not mean that you don’t have a leak or problem. Let Das Autohaus take care of your cooling system needs…and everything else !